Over the next week, St Edmund’s College and Prep will make our own special tribute to mark the centenary of the end of the First World War. For several months we have a ‘Tommy’ at the front of the College. This is from the organisation There But Not There www.therebutnotthere.org.uk whose aim is to commemorate the fallen in the first World War, highlighting the sacrifices made by so many through silhouette installations around the country. There But Not There also aims to educate all generations, particularly today’s younger generation, to understand what led to the deaths of 888,246 people from Britain and The Commonwealth and finally to help heal those suffering from the hidden wounds of post-traumatic stress disorder and other lasting legacies of combat. Over the next few days, we will also have a very special tribute to the 82 Edmundians who fell in service to their country in the Chapel. 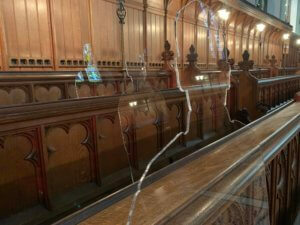 For each of the fallen, a perspex silhouette will be seated in the Chapel, where they would have once sat as students of the College. This poignant and moving memorial will be in place throughout this week and on Monday 12th November we invite and encourage parents, family and friends in the community to visit from 3.30pm to 7pm. To sit amongst these figures and to reflect that each one was a young man who studied at the College, perhaps lived in the local community and who would have sat and prayed in the Chapel is a very special thing. If you would like to visit, the side door to the Chapel, on the front terrace will be open and should be used. No access to the College will be available. Please note that boarders will be in the Chapel for evening prayers at 5pm for 15 minutes. 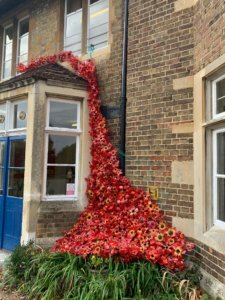 The Prep has their own beautiful poppy cascade at the front of the school with poppies made by the staff and students. There are 450 beautiful, handmade poppies in place which ties into our own celebration of 450 years of our foundation which you are also welcome to view. The silhouette installation will also be in place for our Old Edmundians to visit in the afternoon of their St Edmund’s Sunday celebration on Sunday 18th November ensuring that all our community can pay their respects to our own fallen and the thousands of other men and woman who gave their lives.